Hello, lovelies~ I have been in love with paper products for as long as I can remember. Jotting things down on paper with a pen in hand feels more satisfying than typing on a keyboard for me. I have had my shares of notebook for the past couple of years, so I'm always eager to try new ones. Scoolmate Design sent me two paper-related items a few weeks ago for review purposes. Thank you, Scoolmate Designs. After trying them out for two weeks, here are my review on them. 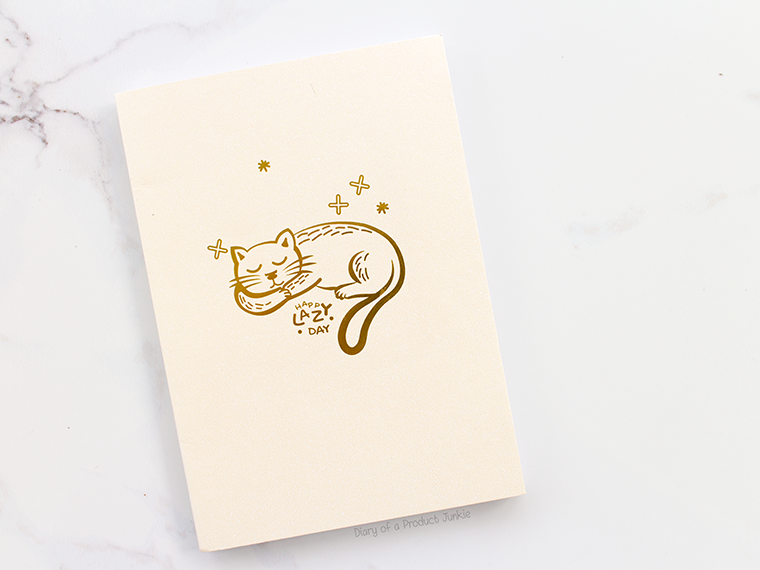 The notebook has a thick cover with a sleeping cat gold foil design printed on the front. I can't quite get the angle right to show the gold foil goodness. It's not a hard cover, but quite sturdy to keep its shape when being thrown in bags and such. 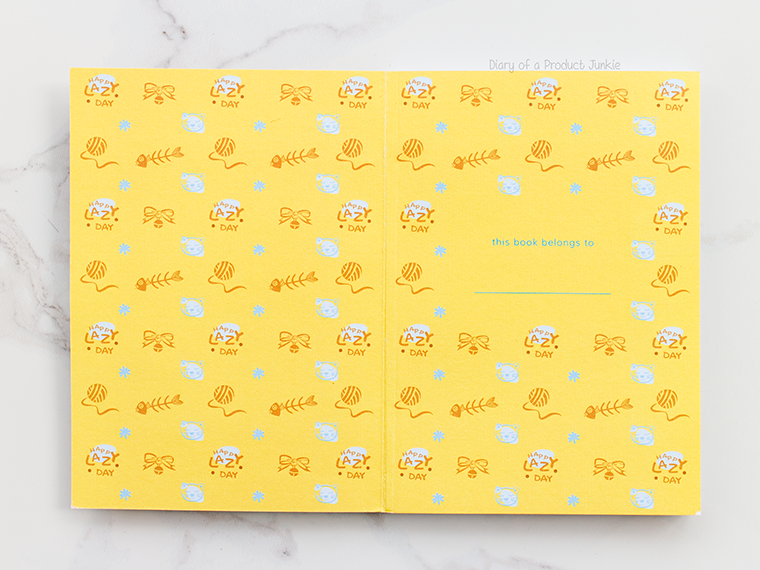 The first page is filled with cuter cat-related items, such as yarn, bell collar and fishbone designs. 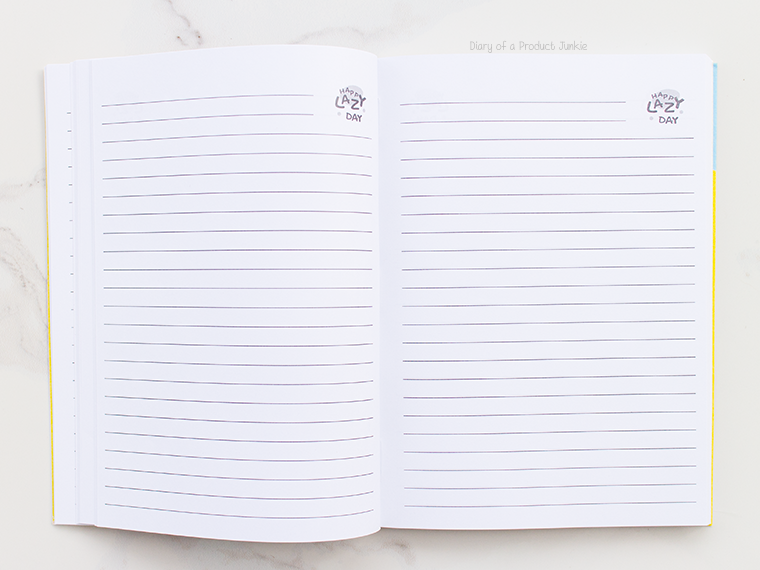 As with most notebooks, the first page is usually dedicated for the owner's information. In this case, you can write down your name in the nicest way possible. I skipped that because my lettering are just awful. The notebook has 48 pages, all which are ruled or lined. The paper feels quite thick, maybe ranging around 90-100 gsm. Don't quote me on that, though. The space in between the lines are too wide for my liking since I have smaller handwriting. I use a Uniball Signo 0.38 for my everyday writing activity, so it is on the thin side and doesn't bleed through. Here are the list of pens I tried to write with on the pages to see if the ink would bleed to the back. Scoolmate also sent me a notepad along with the notebook. 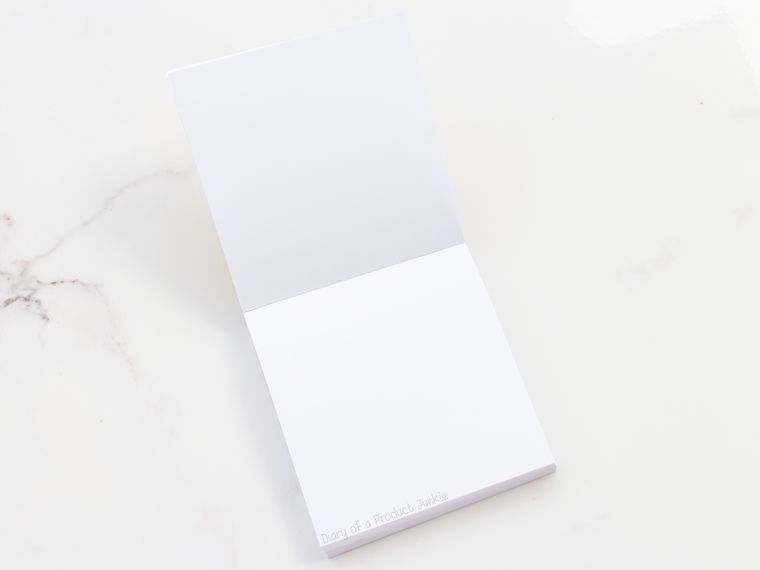 It has a blank pages that you can use to write to do lists, grocery shopping lists, and other things you can think of. The cover of the notebook is the same as the first page of the notebook. The paper feels the same as the notebook, just different layout, so I'm not going to talk much about that. Overall, the products from Scoolmate Designs are of good quality to write on. 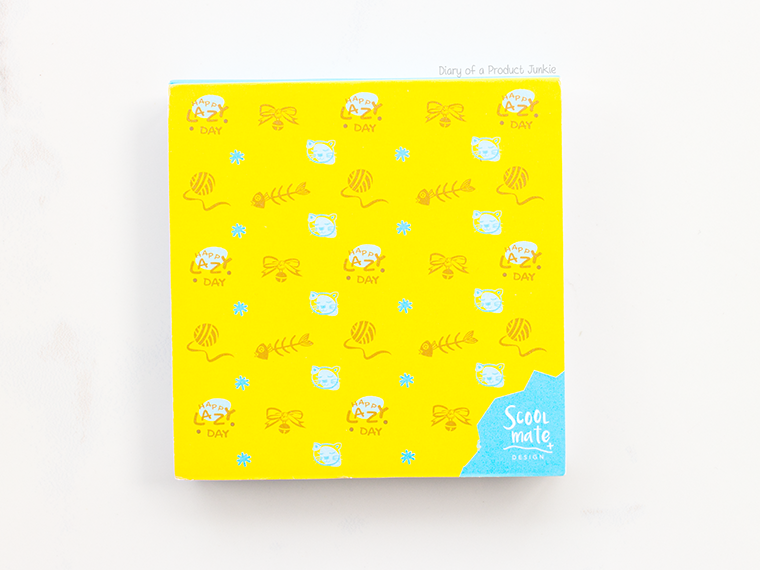 They provide the notebook with a sturdy cover to ensure it from getting bent or folded. 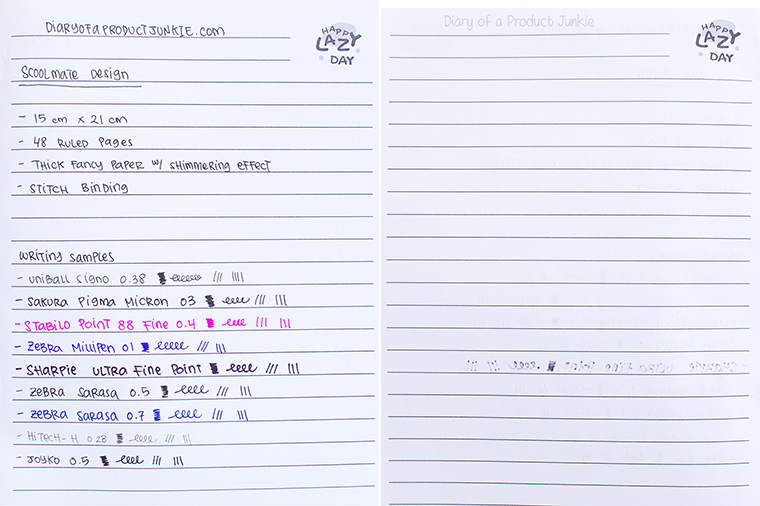 The notepad was a good addition to those who likes to jot things on the go. You can find the prices below.